The Penguin has broken in on his Duckmobile and is about to uncover all of Batman's secrets! Transform from Bruce Wayne into Batman. Find the intruders on the Batcomputer screens in the rotating control center. Select the Scu-Batsuit, Raging Batsuit or The Bat-Pack Batsuit from the wardrobe and get ready for battle! Attack with the Batboat's spring-loaded missiles and stud shooters and steer clear of the Duckmobile's weapons. Capture the penguin invaders in the prison cell... but watch out, they could explode their way out again! 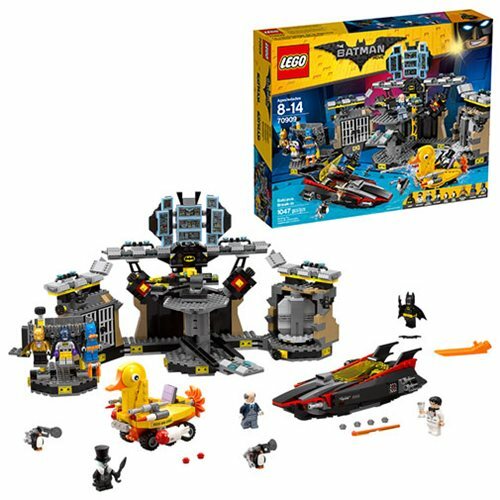 The LEGO Batman Movie 70909 Batcave Break-in includes 1047 pieces. Ages 8-14.